The scarcity of gold German coins from the Prussian Empire make them an excellent addition to coin collections and are a rare collector’s item. With highly detailed designs and a .900 fineness, these historical coins are an excellent investment opportunity – but with limited supplies available, you will have to act quickly to avoid disappointment. Prussian coins are rare and although they are not well sought after among investors, are desired by serious coin collectors. The Emperor Friedrich III date as far back as 1888 and the coins minted from them to 1891 when the reverse design was altered are of particular interest. The Emperor Friedrich 20 Mark gold coins therefore represent an excellent investment opportunity for collectors. The design of the Emperor Friedrich 20 Mark coin features the King’s right-facing profile on the obverse side and the familiar spread eagle on the reverse. The original design of the spread eagle was altered slightly in 1891, when the eagle was made larger and the shield on the bird’s breast smaller. The first bullion coins of the Prussian Empire were struck in 1871 on the orders of Wilhelm I. For the first two years the coins remained unchanged and featured the profile of Wilhelm’s son, Charles III rather than the King himself. 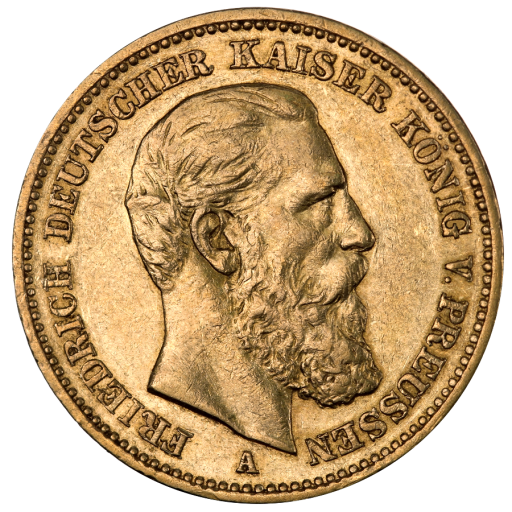 In 1874, the coins were updated to feature the bust of Wilhelm I and it remained this way until his death in 1888, after which he was succeeded on the throne and the coin by his eldest son, Frederick III. German Mints have a long history of producing gold bullion coins to the highest industry standards and although the 19th Century coins do not match the precision techniques of the modern age are still impossible to counterfeit without escaping the attention of experienced dealers – even if a forger is fool enough to try. As a leading distributor of gold bullion coins in Germany, CoinInvest GmbH offers great deals on old German Empire 20 Mark coins. If you are interested in adding these rare and special coins to your collection simply tell us how many you would like to purchase and add your order to your basket by updating the fields to the right of the image at the top of the page. All you need to do then is tell us the country you would like your order to be dispatched to and follow the on-screen instructions to proceed to check-out. CoinInvest also buy gold coins and we are keen to hear from sellers looking to cash in on Emperor Friedrich III 20 Mark gold coins. If you do have any of these special coins at your disposal, please do not hesitate to contact a member of our friendly staff who will be happy to forward an offer by email. We offer excellent rates based on current market prices.